Klaus Bretschneider was born on 4 May 1920 at Berlin-Stieglitz. He was posted to 5./JG 300 in July 1943. He obtained his first victory on the night of 5/6 September 1943. By April 1944, he had, as a “Wilde Sau” night fighter flying single-engined interceptors, achieved 14 night victories during 20 combats. 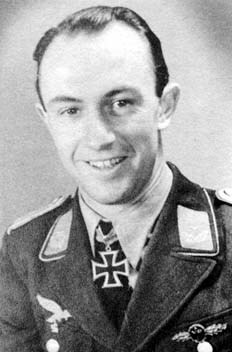 On 19 July 1944, Bretschneider was appointed Staffelkapitän of 5./JG 300. He also achieved success during the day intercepting USAAF four-engined bombers. His best day came on 7 October 1944 when he attacked a group of B-17s. He downed two bombers in one attack and rammed a third. He was later found safe, hanging in his parachute from a tree, on the edge of an 8 meters deep ravine.  On 18 November 1944 he received the Ritterkreuz for 31 victory. 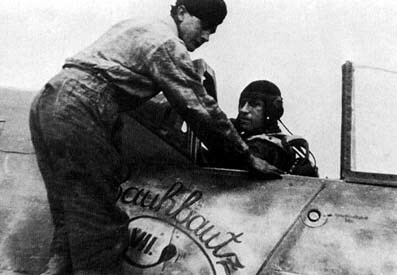 Klaus Bretschneider in the cockpit of his Fw 190A-8/R2 W.Nr. 682 204 "Red 1", Rauhbautz VII. with his mechanic Obgfr. Schmidt. On 24 December 1944, Bretschneider was killed when attacking a group of four-engined bombers around Kassel. Focke-Wulf Fw 190 A-8/R8 (W.Nr. 682 204) “Red 1” was hit by a Mustang, probably from 357th FG, USAAF, over Hausen, near Oberaula in Hessen, and crashed. Klaus Bretschneider shot down 34 enemy aircraft, 14 of them at night. Included in his 20 day-victories were 17 four-engined heavy bombers.